Restoration Studio | We preserve the past for the future. Welcome to The Restoration Studio! We specialize in the conservation and restoration of glass and ceramics, from archaeological artifacts to modern studio vessels and sculptures. Rho Brown is the owner and senior conservator. 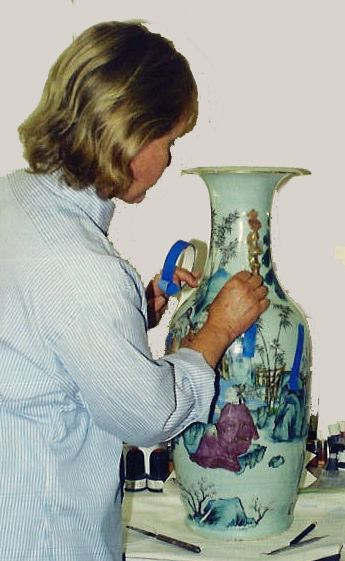 While her specialty is ceramic and glass restoration, she also restores art objects of ivory, jade, wood, marble, stone and bronze. She has studied at the Institute of Archaeology at the University of London, and West Dean College in Sussex, England. 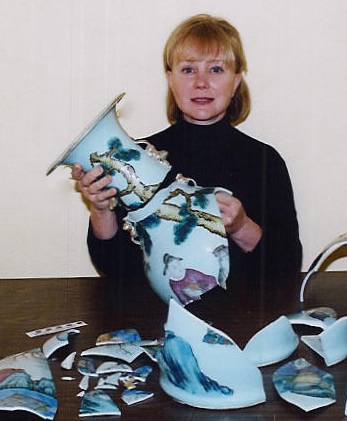 Her classes included Restoration of Greek Pottery, Glass Vessel Restoration, Porcelain Restoration, and Archaeological Ceramic Restoration. In addition, she studied with Benner Larson at the Royal Danish Academy of Fine Arts Conservation School in Copenhagen. The Restoration Studio is located in the San Francisco Bay Area. Before establishing her California practice in 1988, she was associated with Herbert Hillery in Austin, Texas. As you may know, he is the inventor/ manufacturer of HXTAL-NYL, an epoxy that Nigel Williams of the British Museum used to restore the world-renowned Portland Vase. Rho is a member of AIC the American Institute of Historic and Artistic Works, BACG the Bay Area Conservation Guild and WAAC the Western Association of Art Conservation. Rho has consulted for conservators in England, Finland, Germany, Estonia and at the Hermitage Museum in St. Petersburg Russia. Clients include museums such as Fine Arts Museums of San Francisco, San Francisco Asian Art Museum, Desaisset Museum of Santa Clara University, the Getty Trust, and the Oakland Museum. We also serve art galleries, antique dealers, and private collectors.